Swimming has long been a symbol of physical strength in China, yet outside the country's elite sports schools competitive swimming is not an option for ordinary Chinese who might want to take it up as a hobby. For most Chinese, pools are only a place to cool off, not to race. During the peak days of summer when the heat becomes unbearable, the pools explode into a riot of colors as thousands of people jump into it to escape the scorching heat. 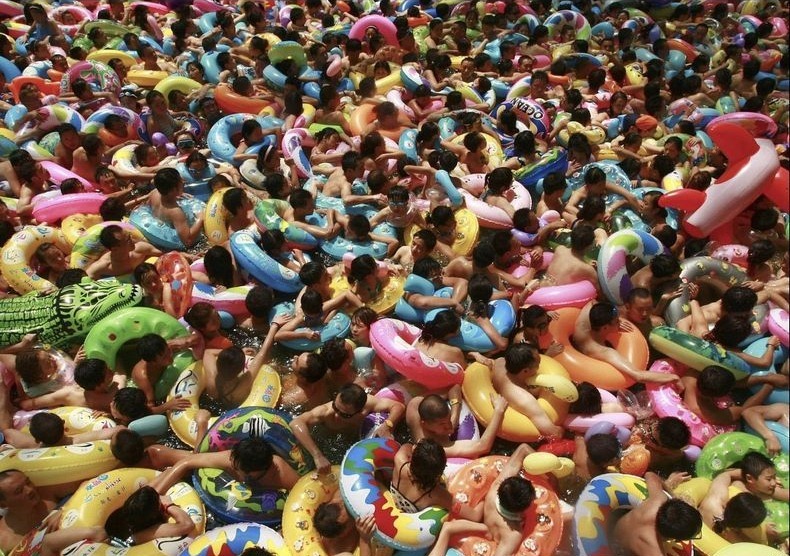 The popular slang expression used for going swimming is "boiling dumplings" because public pools are so crowded that all a person can do is stand on the spot. Lack of swimming facilities is the main reason why pools are crowded in China, and because of this people cannot pursue swimming as a year-round hobby. “Many local governments cannot generate enough money from indoor pools to run them year-round”, said Zhang Yeduan, deputy head of the Hongkou Public Pool, Shanghai's largest. But the number of facilities is increasing as incomes rise and privately run gyms with pools proliferate. Some of these pools are massive. The “Dead Sea of China” is a saltwater swimming pool located in Daying county, Sichuan province, inspired by the original Dead Sea in the Middle East. The pool covers an area of 30,000 square meters and accommodate up to 10,000 visitors at once. Another swimming pool in the Yao Stink district is able to accommodate a staggering 230,000 swimmers at one time.